Still Digging for Roots: #52Ancestors Week 15: Where was Mary Elizabeth (Wolfe) McDaid really born? #52Ancestors Week 15: Where was Mary Elizabeth (Wolfe) McDaid really born? For week 15 of 52 Ancestors in 52 Weeks, I want to touch on the mystery of where my 2nd great-grandmother, Mary Elizabeth (Wolfe) McDaid was born in 1837. While I am fairly certain that I know now, when I was first researching my family history, she confused me! I first found her in the 1880 Census for West Finley Twp of Washington County, PA. She was called Elizabeth and it listed her place of birth as Pennsylvania. That seemed logical, most of my father's side of the family had been born in PA and lived there all their lives. I went back ten years to 1870 and found the McDaid family in the same place, but at that time, they listed her birthplace as Ohio and she was called Mary E. McDaid. So, my first thought was that my g-g-grandfather Samuel McDaid had been married twice. Once again, I went back ten years to 1860 and found Samuel and "Elizabeth" McDaid. Her place of birth was once again Ohio. This led me to believe it was the same woman in all three of those census records and that whoever provided information to the enumerator in 1880 didn't know where she was born. Because my grandma had filled out my dad's side of the family in the family tree chart in my mom's Bible, I knew that Mary Elizabeth McDaid's maiden name had been Wolfe, so it was relatively easy to find 13 year old "Elizabeth Woolf" in the 1850 Census when she had lived with her parents Luther and Nancy in Morris Twp, Greene County, PA. Imagine my surprise when her birthplace was once again listed as "PA." With the 1890 Census unavailable, I next searched for her in the 1900 Census and found "Mary E. McDaid", a widow, living in West Finley with her daughter, Margaret Sprowls and Baby Sprowls. Again, her birthplace was listed as Pennsylvania, and I found the same thing in 1910. By then, I was beginning to think that the two census records that said she was born in Ohio were anomalies of some kind. About that time, I got in touch with my 3rd cousin, Marilyn (McDaid) Varilone, who was also a 2nd g-granddaughter of Samuel and Mary Elizabeth McDaid. She shared her family tree with me. I was surprised to see that she had g-g-grandma's place of birth listed as Mount Vernon, NY! I had never seen any evidence that these people had been in New York, but I wondered if Mount Vernon might be a clue. There is a Mount Vernon in Knox County, Ohio. A search of records for that county indicated that there were people named Wolfe living there and that it seemed possible that a man named Daniel Wolfe of that county was the brother of Mary's father, Luther. Perhaps Mary Elizabeth Wolfe's parents lived for a short time in the same area? While I have not found a primary source for Mary Elizabeth (Wolfe) McDaid's birth, in the early 2000s, I was researching Delayed Birth Certificates for my family members on microfilm at the Family History Library when I came across one for Margaret McDaid Sprowls who was the daughter of Samuel and Mary and the sister of my great-grandmother, May (McDaid) Atkinson. One of the pieces of information required on the form was her mother's place of birth. On it, Margaret had entered "Mount Vernon, Ohio." And while I realize that Margaret Sprowls could have been mistaken about where her mother was born, until I have further information, I'm going to take her at her word! 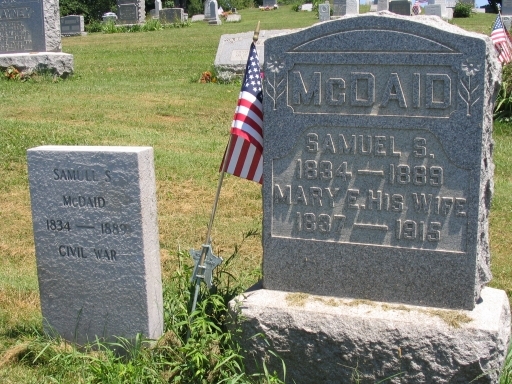 Mary Elizabeth McDaid and her husband were buried with many of their family members in West Finley Cemetery. Take a moment to visit her memorial on Find a Grave by clicking on the photo on the left! Cherie you did a good job with this one. I am enjoying your articles.